Nine breathtaking ideas that impress. A time for harvest favorites and cold-weather necessities, fall is a season where celebrations involve plush blankets, tartan-covered décor, and hints of copper and gold. Whether hosting a wedding, rehearsal dinner, or intimate gathering, creating a table display reflective of autumn’s most treasured elements (pumpkins, pomegranates, and saturated florals just to name a few!) is a unique way to spotlight the magic of the season. We asked some of the wedding industry’s most influential players to lend their best design ideas for crafting a tablescape that’s fall-approved. From colored candlesticks to specialty flatware, the inspiration for setting a fall table has never been more breathtaking. A standout centerpiece and chic placemats will only get you so far. This season, let your flatware sing. 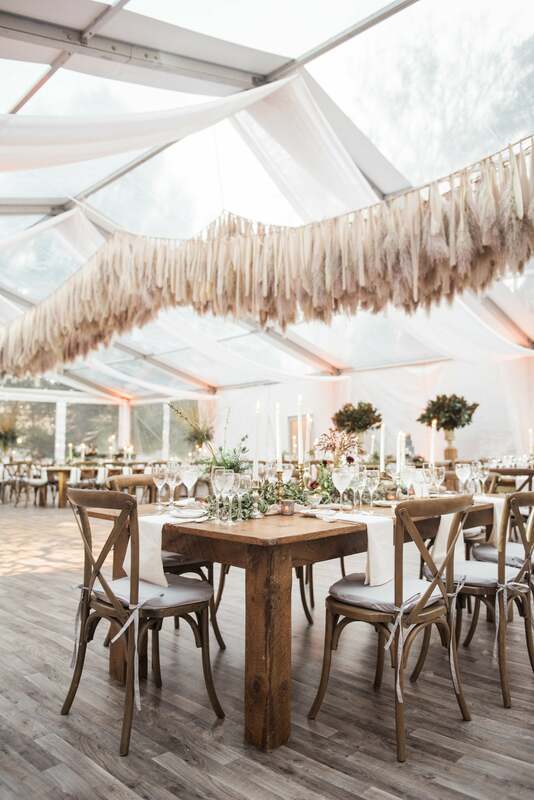 Mixed metals and dark woods will provide the perfect framework for your autumnal fete. A pop of burnt apricot or splash of emerald will instantly elevate the tabletop. Without falling into a trap of celebratory cliches, bring on the drama with dreamy leaves. In the process of dressing up the dinner table, it’s easy to forget about the rest of the room. Instead of relegating your decorating talents to the tabletop, wow your guests with a statement from above. White doesn’t have to feel like a winter wonderland. When complemented with darker neutrals—like charcoal gray or a deep lavender—this snowy hue can feel quite clean and unexpected. Fresh herbs–be it rosemary, thyme, or sage—aren’t just a great alternative for the floral averse, but will naturally infuse the room with invigorating scent. Light the way for a memorable evening with candles—and plenty of them. When displayed together, soaring tapers and tiny tea lights create a visually dynamic scene. From delicate blush and deep burgundy to warm gray and cozy taupe, extend a bonus dose of seasonal splendor with organic hues that space the neutral spectrum. Think beyond standard shades of orange and expected floral arrangements with soft metallic touches and seasonal fruit. Create balance with texture and color. Craft an engaging tablescape by way of texture. Woven placemats, rich wood candle stands, and fluted glass will take your gathering from a snoozy sit down to a lively celebration.